Hook the positive to the O2 side of electrolyser, negative to H2 side. 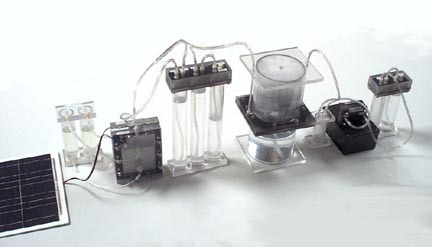 Hook two tubes to each side of the electrolyser. When the two levels are equal the electrolyser is balanced. Fill with KOH to the upper reservoir tube. a. Add a small amount of vinegar to the H2 side and fill with water to 1 inch from top. b. Fill the center tube to 1 inch from top. c. Fill this tube to change the backpressure on the electrolyser. When the electrolyser is balanced both sides of the reservoir will be at the same level. Fill the lower section with distilled water. The backpressure will fill the tower. This MUST be in place to prevent water from getting into the fuel cell. The PEM fuel cell is three slices, for a total of 3 watts, 1.5 volts at 2 amps. a. Anti-siphon to keep water from entering the fuel cell. b. Fill this tube to 1/2 inch from the top. This level will determine the amount of hydrogen stored in the tower. To start operation place the solar panel (1) in the sun. The electrolyser (3)will begin to bubble. As the storage tower (5) starts to fill, the final backpressure (8) unit will start to release bubbles. It will take 5-10 minutes to purge the air out of the system. As the air is purged the fuel cell (7) will start to produce voltage. The open circuit voltage should be near 2.7 volts. When the open circuit voltage is reached turn the fan on and place a small load on the fuel cell. Monitor the fuel cell backpressure (8) and make sure that bubbles are coming out, or that the hydrogen is keeping a backpressure on the water. If the water is pulled back into the anti-siphon (8a) then the load needs to be reduced. Check the balance of the electrolyser in the reservoir (2), if the hydrogen side is higher, remove water from the backpressure (4c), if the oxygen side is higher, add water to the backpressure (4c). The backpressure levels will change as the load is changed. Do not short the fuel cell, it will create excess heat and may damage the fuel cell. Do not run the fuel cell without adequate hydrogen flow. If the water is pulled back into the anti-siphon (8a), immediately lower or remove the load. Do not allow water or any fluids to get into the hydrogen side. Do use a voltmeter and ammeter to monitor the fuel cell performance and parameters. Do start the fuel cell in an open state (no-load), and when the fuel cell is reading ~2.7 volts slowly add a load. Do start the loading process slowly, do not go from open to full load in a single step, this may damage the fuel cell. Do turn the fan on when the load is first applied. The fuel cell will work without the fan, but will not produce full power.